…x 14 1/2" wide) keeps remotes, glasses and more close at hand. Standard armrest cover (23" long x 14 1/2" wide) protects against stains and wear. 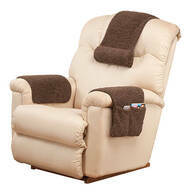 Headrest (20" long x 13" wide) provides support while you relax. Cozy, high-quality sherpa is machine washable and generously sized to fit most armchairs. 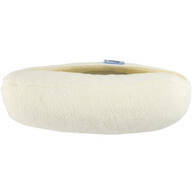 Offering cozy, ergonomic comfort for travel or home, our sherpa car neck support pillow is specially shaped to support head, neck and shoulders. 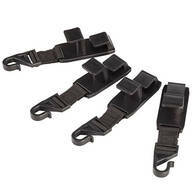 Car neck support is soft, breathable polyester cover; spot clean. Elastic strap fits around auto headrest. Auto neck support is 15" long. Made in USA.